This conservation resource was created by Bridget Trerise, Natasha Feldes, Chazel Solamo, Breagh Kobayashi. During the era of colonialism, with the emergence of conservation and preservation movements, Yellowstone National Park (YNP) was created. This park was created to protect a valuable ecosystem and promote the wilderness conservation movement. However the creation of this park affected several stakeholders and created several issues over land rights, sovereignty, and environmental management. The major affected stakeholder that will be discussed are the traditional Indigenous people of the Yellowstone area, how they initially were displaced from their land with the creation of the park to present day issues they face at the cost of conservation. YNP was created in 1872 and was the first created National Park in the United States. Its boundaries overlap between three different states (see Figure 1). 91 percent is in Wyoming, 7.6 percent is in Montana, and 1.4 percent is in Idaho  This beautiful park is 2,219,823 acres and 3,472 square miles in size  and is federally protected. Furthermore, it is located above a geothermal hotspot which provides essential heat that support for these unique plant and animal communities . The main tree species in this park include over 1,000 native plants and 225 nonnative plant species . Some of the native tree species include: Pinus contorta, Pinus albicaulis, Picea engelmannii, Picea glauca, Pseudotsuga menziesii, Juniperus scopulorum, Pinus flexilis and a few of the plant species include Juniperus Comminus, Artemisia tridentata and Acer glabrum . Mammals such as grizzlies, wolves, bison, elk, antelope and mountain lion populate this National Forest. Needless to say, YNP is full of diversity and its location gives rise to these unique characteristic. YNP was inhabited before time immemorial by several different Indigenous communities. Since Yellowstone was declared a national park, the implementation of conservation management in this park has affected several communities. The stakeholders involved in YNP include governmental organization, non-governmental organizations (NGO’s), and local community members. Burkardt and Ponds outline several stakeholders involved in YNP (see Figure 2) based off of their roles in the park whether a broker, advocate, guardian or arbitrator. A few of the main stakeholders were pulled from this list and discussed in further detail below. The main interested stakeholders include the National Park Service (NPS), the World Wildlife Foundation (WWF), the International Union for the Conservation of Nature (IUCN) and the United Nations Environmental Programme (UNEP) .They are classified as interested stakeholders because they don’t live in the Yellowstone area, rather they hold an interest in a value or service the area offers. For instance, the NPS is being positively affected by the conservation of this area because revenue is generated through the tourist attraction this park brings . Organizations such as WWF, IUCN, and UNEP are involved in the creation of policies that affect YNP which in turn affect how YNP is managed . Some of the affected stakeholders include locals such as farmers, hunters, private property owners, and woolgrowers . These are affected stakeholders because they are being directly affected by the creation of this park. For instance, the hunters are being negatively affected because YNP protects endangered species such as wolves which in turn prey on their game . Similarly, farmers are being affected negatively because the wolves, that the park is protecting, often roam off of the national park and kill their livestock which causes them financial stress . The main affected stakeholders this paper will focus on are the Indigenous peoples associated with this land. The Shoshone, Lakota, Crow, Blackfoot, Flathead, Bannok, and Nez Perce Peoples are the communities that originally occupied this land .They are classified as affected stakeholders because they have geographical, traditional and spiritual ties to the land before colonization. Among the most severely impacted Indigenous groups in the creation of Yellowstone National Park in 1872 were the Blackfeet, the Crow, and the Shoshone (including the Sheepeaters), and the Bannock . These groups each fought for their rights to the land, before and after the establishment of the Park, and each suffered losses during and after their efforts. For example, the Blackfeet, a people known for their war-like attitude, suffered the loss of 173 people in the Baker Massacre in January 1870, an event which led to the end of their battles and their transfer to reservations . To this day, this people fights for their hunting and fishing rights in the land . Another example is the Crow, whose land was transferred to the Park in 1880 even though it was designated as their land in the Fort Laramie Treaty of 1880 . Below are descriptions of the more well-known wars to occur in the Yellowstone National Park area. In the spring and summer of early 1877, the United States government’s efforts to force the Nez Perce onto reserves resulted in the attempt of five Nez Perce bands to flee to Montana, from where they could either join the Crow or escape to Canada . 200 men, 550 women and children, and 2000 horses fled their traditional territories during the Nez Perce War . General O. O. Howard, the leader of the Nez Perce pursuit, issued a group of soldiers under the command of Colonel John Gibbon to cut the Nez Perce off from the front while he himself pursued them from the rear . Gibbon quickly located the group of fleeing Nez Perce and launched an attack on their sleeping camp the morning of August 9, a battle known as Battle of the Big Hole . Although both sides sustained heavy casualties in this battle, Gibbon failed to overcome the Nez Perce, and the Native Americans succeeded in continuing their flight east, toward Targhee Pass . Howard and Gibbon joined together and sent 40 troops ahead to catch the Nez Perce at Targhee Pass while they pursued from the rear . Unable to locate the Nez Perce, the soldiers waiting at Targhee Pass decided to return to Howard, managing to miss both the Nez Perce as they fled toward the Pass, and Howard following behind them . This allowed the Nez Perce to escape through Targhee Pass unhindered . Determined to capture the escaping Nez Perce, Howard called for back-up . Colonel Nelson Miles dispatched several companies, including those led by Colonel Samuel D. Sturgis . Sturgis and his troops anticipated the arrival of the Nez Perce at Clarks Fork River and constructed a barricade to slow the Native Americans upon their arrival . However, his scouts were unable to provide him with information regarding the location of the fleeing band, nor their plans . Meanwhile, Howard continued to follow the Nez Perce along their own trail . When Nez Perce scouts detected Sturgis lying in wait for them, they quickly informed their leaders . The Nez Perce strategically made a visible move towards the Shoshone River . While Sturgis moved quickly to head them off there, the Nez Perce doubled back and escaped through the Clarks Fork Canyon, a place where Sturgis never anticipated their escape due to the steep terrain . By the time Sturgis realized that the Nez Perce were not coming to the Shoshone River after all, the Nez Perce were already crossing the Plains with Howard behind them . The Nez Perce continued toward Canada, but Colonel Miles found them camped merely forty kilometers south of the border . The ensuing battle lasted six days, with the Nez Perce suffering from cold and food shortages . Finally, 431 Nez Perce surrendered, while approximately 300 others fled to Canada . Those who surrendered were promised by Miles and Howard that they would return to reserves on their traditional territories, but they were instead deported to Kansas . They fought for their return to their homes for many years, with Miles personally appealing to the President of the United States on their behalf . Although they were eventually permitted to return to Washington, they never returned to their traditional territories . 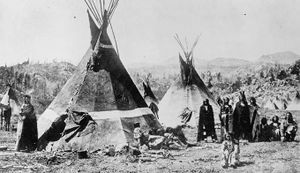 Several factors led to the onset of the Bannock War in 1878, including disrespected treaties, food shortages, pressure on the lands by settlers, and tensions from the Nez Perce War . When the Bannock were asked to give up their homes and guns, the War was officially underway . The Bannock began searching for allies against the United States government . When Bannock Chief Egan was killed by the Umatilla people, pretending to be sympathetic to the cause, the war was effectively over . The Bannock warriors were split; some were killed in battles while others fled to nearby reservations . A few raiding parties continued to steal the provisions from government officials in the Park following the War . The main group of raiding Bannock was defeated by Colonel Nelson Miles on September 4, who heard of them while traveling through the Park on vacation . He found the Bannock camp and attacked, killing 11 and capturing 31 . On September 12, another group of raiders was defeated in a confrontation with Lieutenant Hoel Bishop and his 30 soldiers and 150 Shoshone followers . Tensions between Indigenous Peoples, settlers, and the government remained high following the Bannock War . Following the nine settler deaths linked to the Sheepeater people in 1879, General O. O. Howard sent soldiers to pursue the Sheepeaters . The troops searched for the Indigenous people for four months before Lieutenant Henry Catley finally located them when they attacked his troops . Catley had no choice but to retreat . The Sheepeaters continued attacking settlers surrounding the park, so Howard ordered that the pursuit be renewed . In the end, the Sheepeaters surrendered as they grew tired of fighting . The military captured 60 Sheepeaters . The end of the Sheepeater War marked the end of the majority of Indigenous presence in the Yellowstone National Park . Before YNP was created several Indigenous communities occupied the land. There are several associated Indigenous tribes with the park and surrounding area. The biggest issue surrounding the creation of YNP is that the Indigenous people of the land was not consulted and instead were forced off of their land. This is a common underlying theme through the colonialism period where several Indigenous communities removed and displaced from their territory by settlers with the ideas of preservation and manifest destiny. More specifically, they were forced onto reserves prohibiting hunting and gathering in the park The Indigenous people’s way of living, such as burning and hunting, did not line up with the idea of preservation . People viewed natives as visitors to the land; therefore, they did not expect them to be greatly affected by their relocation . The Yellowstone Model, which was the first national park model for management, included the removal of the social history of Native American land use and even Native Americans themselves  . “Native Americans, as with people displaced by protected areas around the world, were then made to reappear in these landscapes as purveyors of arts and craft, entertainment, and other services required by visitors” . The cost of conservation for Indigenous peoples were huge as they had the option to either leave or assimilate. Their traditional ways of living off of the land was no longer acceptable. Over the years, tourism has brought notions that portrayed Native Americans as unnatural and threatening to the current YNP ecosystem.Movements to raise conservation in the late 1800s and early 1900s progressed into the unintentional amplification of negative connotations surrounding Indigenous Peoples, which continues to be a problem to this day. However, the Indigenous Peoples used land management practices to sustain beneficial plant and animal species. These practices such as burning, selective harvesting, planting and seasonal migration were performed to maintain the ecosystem for years. To some extent, there still exists a huge miscommunication regarding American Indian rights and practices. The National Park Service accommodated certain ceremonial practices and entry to sites that are deemed religious and they are fairly safeguarded as to preserve these locations. However, some elders are still under the impression that they are prohibited from YNP although in 2001, Yellowstone National Park did change its entry policy to permit members of associated tribes to get to the park for cultural purposes without paying the recreation fee. The Government also arranges and maintains discussions with the YNP tribes associated with the lands regarding the conservation, restoration reconstruction of traditional lands and they are undertaken in accordance with The Secretary of the Interior’s Standards for the Treatment of Historic Properties with Guidelines for the Treatment of Cultural Landscapes.However, more work should be put into allowing the Indigenous Peoples to be in charge and in control of the resources that they depend on. Basis for change is broadly supplemented by several international agreements, which delineate indigenous territory rights and settler-state government obligations. These documents could be a useful tool in the pursuit of land justice in YNP. These documents include the United Nations Declaration of the Rights of Indigenous Peoples, within which articles 8, 25, 26, 28, and 29 are especially relevant . Article 8j  and Article 10 of the Convention on Biological Diversity describe indigenous rights in the context of conservation efforts. As well, Convention C169 of the International Labour Organization describes indigenous rights to their traditional territory and resources . More specifically, the creation of the Durban Accord Action Plan at the Vth IUCN World Parks Congress in 2004 describes what needs to happen regarding indigenous rights in the context of conservation in protected areas . Main targets 8-10 include: ensuring that the management of protected areas is in accordance with indigenous rights ; ensuring that protected areas management includes representation by indigenous people ; and, creating interactive ways in which indigenous land that was appropriated for parks—without free, prior, and informed consent—can be restituted . These main targets are followed by calls to action at the national, local, and management level . These targets and actions give a clear vision to what protected areas like YNP should be like. Prior to the Durban Accord at the Vth World Parks Congress, the Forest Peoples’ Programme made several recommendations for goals that the Durban Accord should develop procedures for . Successful implementation of these recommendations would certainly lead to stakeholder equity in YNP. The FPP suggests that: national laws and other guiding frameworks should be modified so that they are conducive to indigenous peoples owning and managing protected areas ; there should be enough financial support of law and policy modification ; national and international offices of protected areas management should be retrained in accordance with these law and policy changes ; all international conservation agencies should ensure that indigenous rights dictate protected area plans ; there should be no discrimination in conservation management ; and, indigenous self-representation and autonomy should be supported, along with their pursuit of land rights . Sections V.24 and V.25 of the IUCN Vth World Parks Congress document—which outline suggestions from the Congress Recommendations Committee—contains countless valuable ideas that reiterate many of the ideas described above . Indeed, all of this international framework ought to be followed by results at a local scale. In the context of the United States of America, Executive Order No. 13007 (Indian Sacred Sites) is critical: it implies a legal obligation for land managers to ensure that America's Indigenous nations can use and access sacred sites, that these sites are protected, and that private cultural information is protected . Work by Jeanette Wolfley in 2016 provides many recommendations regarding sacred sites that would absolutely ensure effective implementation of Order 13007 in the United States , and these recommendations are certainly reflective of the international consensuses outlined above. First of all, it would make sense to have the definition of sacred sites rewritten by the Indigenous people themselves in Order 13007 . Order 13007 would also be more effective if it was ensured that anthropologists were in collaboration with members of the Indigenous communities in site identification . As well, it has been identified that there must be trust and communication between Indigenous communities and park managers, which can be achieved with park staff re-training, education of staff on Native American culture, joint management of sites, and better communication in general . Part of better communication includes better consultation processes, which are more effective when they are dictated by the Indigenous nations themselves, ensuring that their values and needs are actually accounted for . Consultation should be representative of all the important tribe community leaders, and should be in-person . Regular meetings and documented communication are also indicative of strong relations . Nonetheless, site access is clearly not the ultimate form of justice for what has been lost. Would it not be better to implement the land restitution that is clearly needed  within Yellowstone National Park? It may seem that this is impossible in the restricting context of the parks system in North America. However, there have been cases in the United States of Indigenous nations gaining reserve land within national park boundaries. After being forced off of their territory during colonization and park creation, and being marginalized to a reservation, the Havasupai Tribe gained reserve land from US parks and the Forest Service, as well as some area for use within Grand Canyon National Park in 1975 because of the Grand Canyon Enlargement Act . However, this case unfortunately has left the Havasupai with rights and use limitations . A better example from the United States is that of the Timbisha Shoshone Tribe: they also lost their territory to colonization and park creation and were restricted to a small reserve, but the Timbisha Shoshone Homeland Act of 2000 gave them a much bigger reserve which included land within Death Valley National Park . The Timbisha Shoshone Homeland Act was created in part to include effective collaboration between the Timbisha Shoshone and park management . These cases prove that progress can be made regarding land justice within the US parks system. However, a case involving YNP would be much more complicated due to the large number of tribes that claim traditional territory within the park. In this section, we invite contributions from scholars and students to broaden the scope of the possible remedial actions and of the process of reconciliation. Creation of Yellowstone National park lead to the initial displacement of Indigenous communities off of their traditional territory and onto reserves. The cost of conservation for these Indigenous communities was the right to practice cultural traditions on their land and forced resettlement. Since then there have been efforts to reconcile the past and by re implementing Indigenous communities into the park through employment or through policies focussed on co-management and collaboration. However, the problem today is that the policies put in place do not always line up with what is actually put in practice. Evidently, there needs to be more cooperation and communication between Yellowstone National Park Management and the Indigenous communities who traditionally used the lands there so that nationally and internationally recognized laws and policies can be more effectively put into practice. Indigenous nations, such as the Shoshone, Lakota, Crow, Blackfoot, Flathead, Bannok, and Nez Perce Peoples should have more freedom to access and use park resources, because this would benefit their cultural survival, and allow the park to be managed with more insight on ecology and historical anthropogenic influences on the park. In a broad sense, the simplest proposal for action would be to ensure the successful implementation of the Durban Accord Action plan (and various other international policies) as described above. More specifically, this means better implementation of laws surrounding sacred site access within the park (Executive Order 13007,) which must be accompanied by real trust, communication and mutual understanding . This advice on trust should be continually applied to the practice of YNP’s own policies. Simultaneously, more progressive options should be explored, taking inspiration from United States case studies of Indigenous communities regaining park land . The complex work of creating co-management plans should begin as soon as possible. ↑ 1.01.1 (YNP) Yellowstone National Park (2012) Yellowstone National Park: park facts. para 4. Retrieved from: http://www.yellowstonegeographic.com/faqs.htm. ↑ 2.02.12.2 Herbert, N (n.d). Yellowstone: plants. National Park Service. para 3. Retrieved from: https://www.nps.gov/yell/learn/nature/plants. ↑ 6.006.016.026.036.046.056.066.076.086.096.106.116.126.136.146.156.166.176.186.196.206.216.226.236.246.256.266.276.286.29 Janetski, J. C. (1987). Indians of Yellowstone Park. Salt Lake City, UT: University of Utah Press. ↑ 7.007.017.027.037.047.057.067.077.087.097.107.117.127.13 Janetski, J. C. (2002). 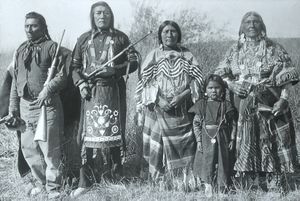 Indians in Yellowstone National Park. Salt Lake City, UT: University of Utah Press. ↑ 9.09.1 West, P., Igoe, J., & Brockington, D. (2006). Parks andpeoples: The social impact of protected areas. Annual Review of Anthropology, 35, 251-277. Retrieved from http://archives.cerium.ca/IMG/pdf/Parks_and_people.pdf. ↑ Wolfley, J. (2016). Reclaiming a presence in ancestral lands: The return of Native Peoples to the national parks. Natural Resources Journal, 56(1), 55-80. ↑ Exec. Order No. 13007, 3 C.F.R. 26771-26772 (1996).